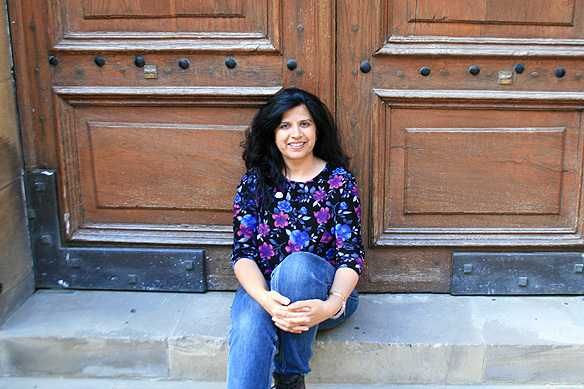 On the steps of the Sheldonian Theatre where Oxford’s graduation ceremonies are to date conducted in Latin! First let’s get the bigger picture in place. 🙂 Oxford University is not one campus. 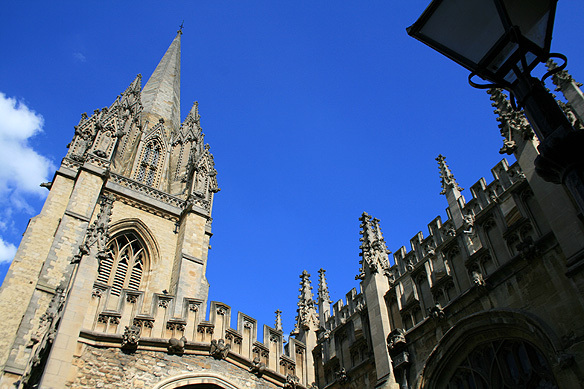 It is made of 38 independently founded colleges, each with its own history and administration. Originally there were no buildings as such. The university consisted of a group of students gathered around individual masters. And when did it all begin? 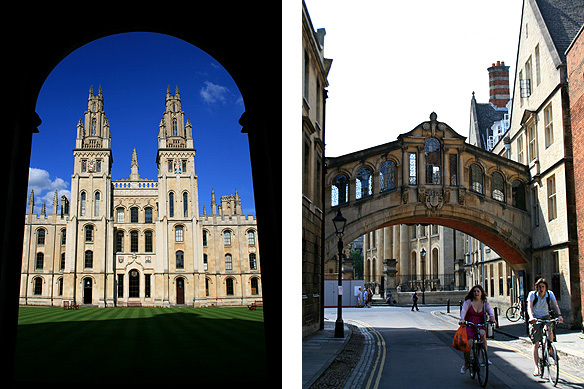 The oldest college dates to the 13th Century. The university as a seat of learning goes back to the 10th Century. 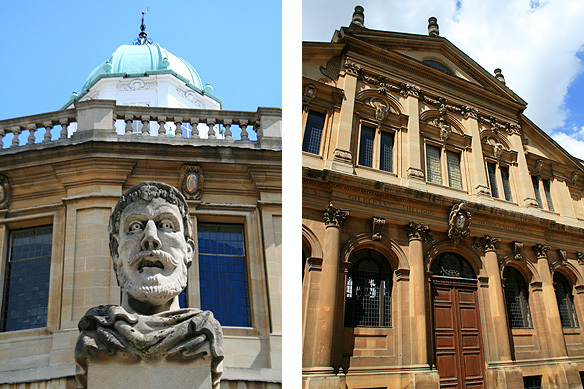 The most beautiful part of Oxford, for me at least, is the rich juxtaposition of the Bodleian Library (1602) surrounding the Old School Quadrangle, the Christopher Wren designed Sheldonian Theatre and the Divinity School. The honey coloured stones and worn doors echo years of learning and ideals as high as the heavens. And around this inner nucleus are scattered the university’s numerous colleges, heavily guarded behind colossal stone walls lining cobbled streets, the spires of their chapels soaring in the skies. I visited Jesus College where Laurence of Arabia had been a fellow and Christ Church College with its magnificent Tom Quad and 800-year-old chapel. 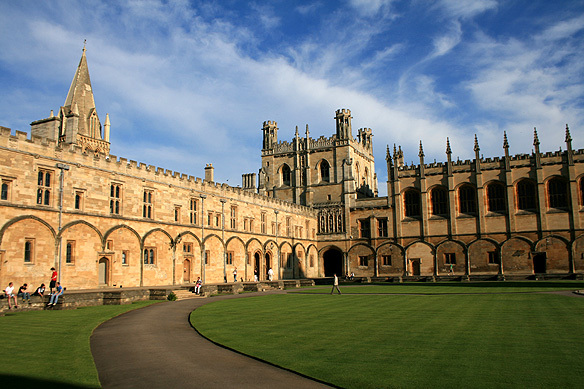 Thirteen of Britain’s Prime Ministers have studied at Christ Church. 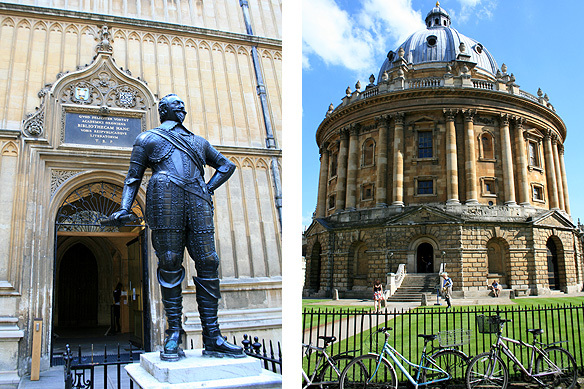 There are no classes per se in Oxford. That’s the x-factor that sets it apart historically and globally. Merely tutorials, where between one to four students discuss assignments with their tutors. 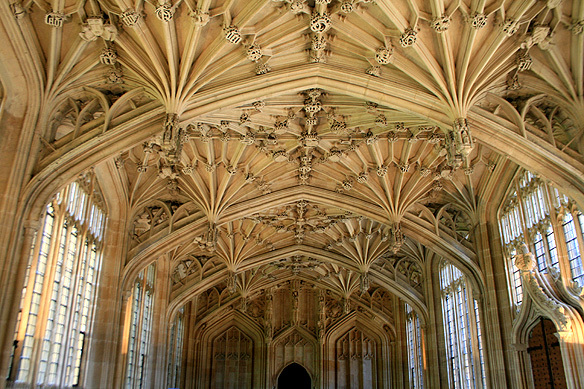 Built around quadrangles, the colleges each have their own chapels, and often hold formal dining 4-5 times a week replete with silver, candelabras and five-course meals. And so one’s college becomes home, class, club and hang out. 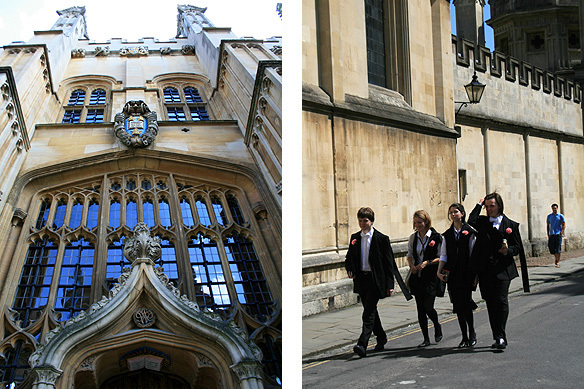 An emphatic upper crust Englishness—of public schools, clipped accents and heavy rhetoric—prevails over the University town, where customs and traditions rule, and honour and chivalry overshadow practicalities. Students study hard. But famously drink hard too. The bars are perpetually full. There aren’t many foreign students. A handful, mainly from scholarships, trickle through the lanes. There were exams taking place today. A colourful sight as students have to wear their uniforms topped with black gowns and carnations, which are exam colour coded if you please, to the examination hall. Come evening time these same students transformed into creatures weird, grotesque and some actually cute for the end of exam bops [big fancy dress parties]. This entry was posted in England with London, Exploring our World and tagged Bodleian Library, Christ Church College, Christopher Wren, Divinity School, English Public Schools, Jesus College, London Walks, Oxford, Oxford University, Radcliffe Camera, Sheldonian Theatre, Student Life in Oxford, Things to see in England by Rama Arya. Bookmark the permalink.